Welcome to our Community Spotlight, a series spotlighting our favorite creatives that are making their mark in the world on their own terms. 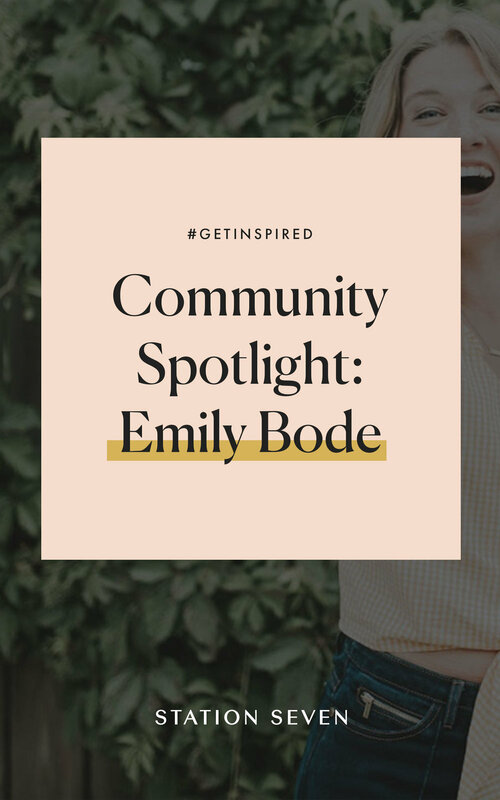 Today we’re talking with designer, writer, and all around creative thinker Emily Bode. In addition to being named one of Top 100 Women Bloggers to Follow, she continues to celebrate style, creativity, and living simply through her self-titled blog and newsletter. Read on to learn more about the challenges of remaining an ad-free blog, and how blogging has allowed her to grow her confidence as both a writer and a designer. 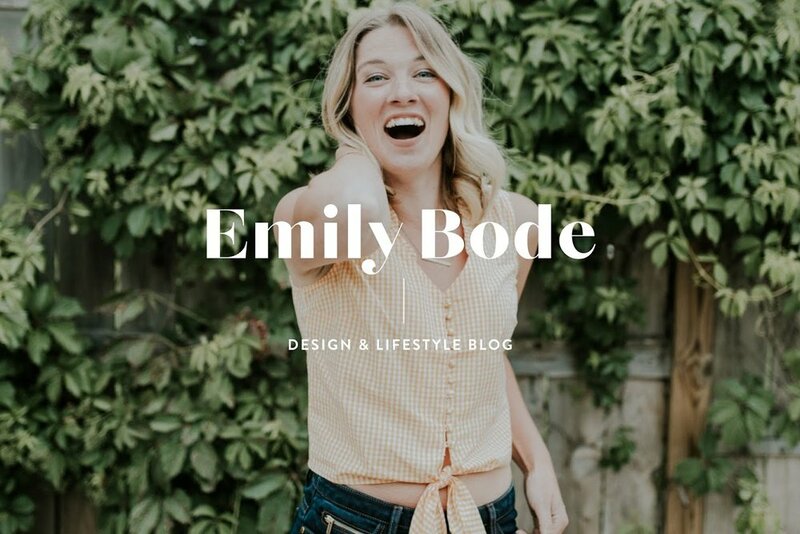 Emilybode.com is a lifestyle blog through the lens of a designer. I write about my constantly evolving creative process, my capsule-inspired wardrobe, and living in a small midwestern cottage with my husband and German shepherd. Most of my posts are in tune with the moon and support my seasonal newsletter, Creative Grace. I started my blog 5 years ago (formerly named Brave Girl) because I wasn’t happy with the direction my career was going. I needed the courage and accountability to explore creativity my way. It’s funny to look back now on the first couple of years. I tried to find my footing writing about anything and everything; DIY’s, homemade facial recipes, book lists, a chakra watercolor series, I was all over the map. Brave Girl was the catalyst to where I am now as a freelance designer, writer, and the reason for renaming to Emily Bode this year. As it turns out, I wasn’t the only one needing courage. Many creatives have since shared with me they found the brave girl within themselves after finding my blog. Something they read from my experience gave them permission to pursue their creativity. They thought they were alone then realized they’re not alone and they CAN do it. Thank God some of my doozies have helped others, that made them worth it! Haha. The road to yourself is a bumpy one but creativity is good, good company. How has starting your blog impacted your life? It’s impacted my confidence as a designer and writer and surprisingly, my personal style. Writing under the moniker Brave Girl was an aspiration mostly. I was such a serious, over-analyzing, and doubtful child. Blogging helped me unearth a lot of those layers because writing has always been like holding up a mirror for me. It nudged me out of my comfort zone on my own terms, becoming a safe space to explore my thoughts and feelings on career, relationships, and my creativity. My biggest challenge has been remaining a blog independent of traditional advertising. It’s definitely a more difficult, less revenue-friendly road to forego ads on my blog but I can’t seem to sacrifice design aesthetic to include them! I don’t like the distraction advertisements bring to the reading experience and I don’t want my readers digging through third-party content to reach mine. I’m proud of my stance on it however I’ve witnessed many magazines and online publications change similar ad missions midstream because it’s really difficult to maintain. I continue to try my best with it though. My biggest win is being on the Top 100 List of Women Bloggers to Follow by Feedspot and recently being a nominee for 20 On the Rise, a celebration by Honeybook for the up and coming voices in the creative industry. Each of these acknowledgments are a testament to this labor of love of mine and a great reminder that everyone’s story matters. I did have help and am so grateful for it! Having help allowed me to have a blog that went beyond what I originally envisioned it could be. I had the Analogue theme installed (having the install add-on is worth EVERY. SINGLE. PENNY) with custom homepage images to make them vertical and Pinterest-friendly (thanks Mike!). A web developer friend of mine brought 5 years of content over and I used my design experience for the rest of the build. Incorporating my new brand identity into the WordPress theme with fresh typefaces, color palette, and different layout options per page was icing on the cake! If you’re looking to start a blog, ask yourself why. Why do you want to start one? There isn’t a right or wrong answer to this question. There will be as many unique answers as there are people. Asking yourself WHY will root you in the reasons you’re starting. This can always shift, of course, but having that dialogue with yourself will help you when the outer voices around you get louder. And believe me they will, as is always the case when you start a new journey, but your blog will remain yours if you listen to yourself first. You can find me on Bloglovin’, Instagram and Pinterest!